March 11, 2017 - No Comments! Do you remember in great detail all the websites you've clicked through today? Probably not. Now let me ask you this, do you remember any videos you have watched this past week? Of course you do. An online poll states, 80% of users recall a video ad they viewed in the past 30 days. You share them with your friends for laughs, ideas, training, or networking. We are all highly visual and if we can't make customers taste, touch, or smell our product, we need to boost the sight and sound to engage a response. That's where the power of video and its many facets step in. Facebook has launched 360 Video, Live Video, and the auto-playing of videos. Instagram put in place 60-Second Videos & Instagram Stories, Twitter has Periscope and YouTube is the second most popular social network in the world. What company flyer is going to stand out when your competition has videos engaging customers at trade shows and on video boards? People want a bite-sized overview of your company that appeals before they will investigate further and stay loyal to your brand. You need to evoke an emotional response dictated by sight and sound. What better way than to make animated explainers, a series of amusing narratives, or by giving an emotive back story that personifies your brand. Videos make friends out of strangers and that means brand loyalty for you. Reebok boosted sales with their recent #HonorYourDays campaign highlighting brand longevity and linking wearing Reebok as producing peak performance in fitness at any age. They targeted a woman reflecting on her life and challenging herself to be better and not give up through flashes of strong women and girls running towards a goal. Customers could see themselves in these people because they were visually taken back or forward in time visually and given a sense of purpose. What about mid-sized companies who are still establishing their brand? Dissolve, a stock footage and photography company has been drawing customers in to purchase their stock with brand awareness through the download of free fonts through viral videos. A recent spot for the font Bookmania Bold features 1950s stock footage displaying the font in one of its many uses to illustrate they are providing a total package to designers with footage, photography and free fonts to capture their project's creative style. Once a customer decides on a freebie, they are asked to sign up welcoming them to the brand family. Do their customers turn on a TV or read a newspaper? No, they need only look for a video in their Facebook newsfeed. A website is not enough. Maybe in the 1990s, but not today. Insivia.com reports including video on a landing page can increase conversion by 80%. 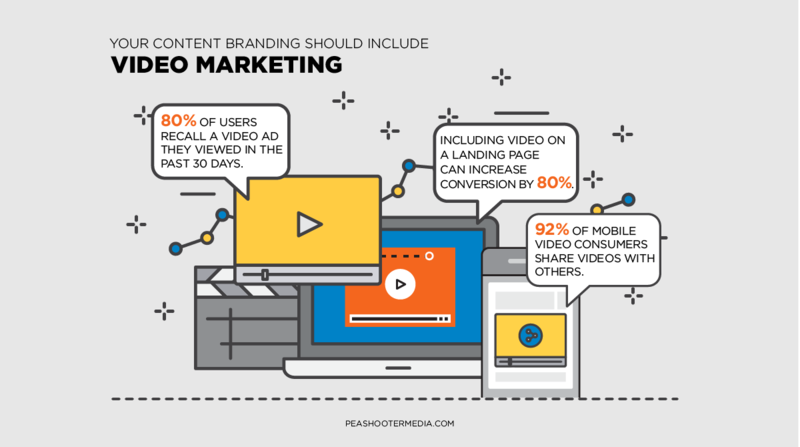 92% of mobile video consumers share videos with others. Your website needs to be part of your brand not your whole presence. People get bored easy and need continuous stimulus that engages and entertains their thoughts towards your objectives. A website, company/product app, and a continuous flow of viral videos showcasing different aspects of your product or service, whether playful or instructive, is the integrated approach needed to capture clients before the competition and distribute your budget effectively through the right channels. Peashooter Media engages in this integrated media method, delivering not just a component, but building the whole package to your specs to use as a foundational tool for your brand. Through videos, motion graphics, websites, graphic design and social media integration we ensure your visual presence gets boosted for a lift beyond your competition. Contact Us and go viral today at studio@peashootermedia.com or 905-535-0992.